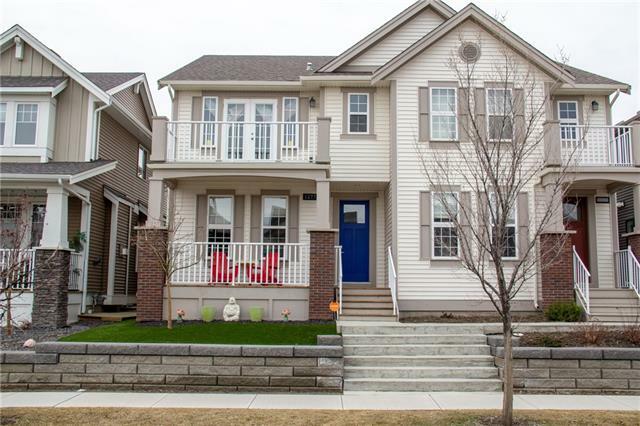 DESCRIPTION Immaculate Fully Finished 2 Storey family home w/ over 3300 Sqft of Developed Living Space. You are greeted with a Bright Foyer w/ Tile Floor leading an Open concept living space w/ UPGRADED hardwood floors, 9' Ceilings. Stunning Kitchen featuring Maple cabinets, Stainless Steel Appliances, tons of quartz counter space, Eat-up Bar and Large Walk-in corner pantry. Large Dining Room the leads to South facing Private Back Deck w/ Gas line for BBQ, steps to the Hot tub and Concrete Patio Area. The spacious Living Room features a gas fireplace w/ Wood Mantle and Tile Surround. The Main level is wired for sound with in-ceiling speakers. 2pc Powder Rm completes the Main level. Upstairs you will find a Huge Master Retreat and 5pc Ensuite w/ Tile Floor, His/Her sinks, corner tub & O/S Tile shower, separate toilet and huge Walk-In Closet. Two more Generous sized Bedrooms connected by a 4pc Jack 'n Jill bath. Home for sale at 23 Cooperstown PL Sw Airdrie, Alberts T4B 3T5. Description: The home at 23 Cooperstown PL Sw Airdrie, Alberta T4B 3T5 with the MLS® Number C4225327 is currently listed at $559,000.